The global work order management systems market was valued at USD 358.2 million in 2017, and is expected to reach USD 694.6 million by 2023, at a Compound Annual Growth Rate (CAGR) of 10.9% during the forecast period. The forecast period is from 2018 to 2023, whereas 2017 is the base year for estimating the market size. The main objective of this report is to define, describe, and forecast the work order management systems market by component (solution and services), deployment type, organization size, industry vertical, and region. The report provides detailed information about the major factors, such as drivers, restraints, opportunities, and industry-specific challenges, influencing the growth of the market. 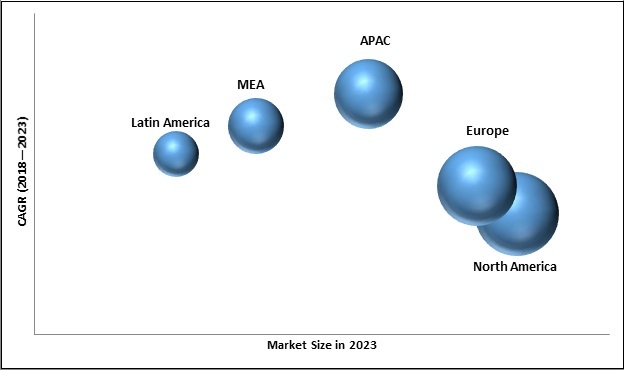 This report estimates the market size with respect to 5 main regions, namely, North America, Europe, Asia Pacific (APAC), Middle East and Africa (MEA), and Latin America. It strategically profiles the key players and comprehensively analyzes their core competencies. It also tracks and analyzes competitive developments, such as mergers and acquisitions, new product developments, and Research and Development (R&D) activities, in the market. The work order management systems ecosystem comprises several work order management system providers, such as NetSuite (US), IBM (US), Microsoft (US), IFS (Sweden), ClickSoftware (US), Astea (US), Infor (US), ServiceMax (US), Coresystems (Switzerland), FieldAware(US), ServiceNow(US), ServicePower(US), Corrigo(US), eMaint(US), Innovapptive (US), Fingent (US), ServiceChannel(US), FieldEZ(India), 3Floorsup(Australia), Hippo CMMS(Canada), Fieldpoint Service Applications(Canada), Sockeye Technologies(Canada), Maintenance Connection(US), MEX(Australia), and Loc8 (Australia). MarketsandMarkets expects the global work order management systems market size to grow from USD 414.1 million in 2018 to USD 694.6 million by 2023, at a CAGR of 10.9%during the forecast period. Major driving factors for the market include the increasing adoption of mobile apps and wearable devices among field workers. Major industry verticals in the market include manufacturing, construction and real estate, energy and utilities, transportation and logistics, and consumer goods and retail. The report segments the work order management systems market by component, deployment type, organization size, industry vertical, and region. The solution segment is estimated to dominate the task management software market in 2018, while the services segment is expected to grow at a higher CAGR during the forecast period. Work order management solution and services are gaining popularity, as they enable enterprises to effectively utilize field workforces, resulting in improved performance and enhanced customer experience. Among deployment types, the cloud deployment type is expected to gain more traction during the forecast period, as it offers the agility of on-demand resource deployment and consumption. Organizations prefer the cloud deployment type, as it delivers ease of access along with reduced capital and operational expenses. The Small and Medium-sized Enterprises (SMEs) segment is expected to grow at a higher CAGR during the forecast period. The growing focus on reducing operational costs and streamline service delivery is expected to drive the adoption of cloud-based work order management solution and services among SMEs. Enterprises in major industry verticals such as manufacturing, energy and utilities, transportation and logistics, construction and retail, consumer goods and retail, healthcare and life sciences, BFSI, telecom and IT and others (government, and media and entertainment) are rapidly adopting work order management systems to optimize their field workforce utilization. The manufacturing industry vertical is expected to hold the largest market size during the forecast period, while the telecom and IT industry vertical would provide growth opportunities for vendors of work order management systems during the forecast period. The report covers the work order management systems market by 5 major regions: North America, Europe, Asia Pacific (APAC), Middle East and Africa (MEA), and Latin America, to provide a region-specific analysis. North America is expected to hold the largest market size during the forecast period, owing to the large presence of vendors in the region. North America is also the most advanced in terms of technology adoption and IT infrastructure optimization. Work order management systems help organizations with field workforce optimization. Enterprises adopting the work order management systems usually face issues of lack of expertise among field workers to use work order management systems. Consequently, it could restrain the growth of market. The advancements and applications of Machine Learning (ML), analytics, and Artificial intelligence (AI) in work order management systems are expected to provide significant growth opportunities for the vendors. Major vendors offering work order management systems across the globe include NetSuite (US), IBM (US), Microsoft (US), IFS (Sweden), ClickSoftware (US), Astea (US), Infor (US), ServiceMax (US), Coresystems (Switzerland), FieldAware (US), ServiceNow (US), ServicePower (US), Corrigo (US), eMaint (US), Innovapptive (US), Fingent (US), ServiceChannel (US), FieldEZ (India), 3Floorsup (Australia), Hippo CMMS (Canada), Fieldpoint Service Applications (Canada), Sockeye Technologies (Canada), Maintenance Connection (US), MEX (Australia), and Loc8 (Australia). These vendors have adopted various types of organic and inorganic growth strategies, such as new product launches, partnerships and collaborations, and mergers and acquisitions, to further expand their offerings and presence in the global work order management systems market.